When getting together this holiday season with family and friends I am planning to serve a new favorite in our home, Vino-Licious Wine Mixers from Old World Gourmet. Vino-Licious offers a selection of delicious frozen wine mixers are sure to be a hit and it is a fabulous way to elevate a simple bottle of wine to new flavor levels. It is so simple to mix up a frozen beverage using Vino-Licious Wine Mixers. I just chose my favorite bottle of wine, added the mix and a splash of water and freezes it. 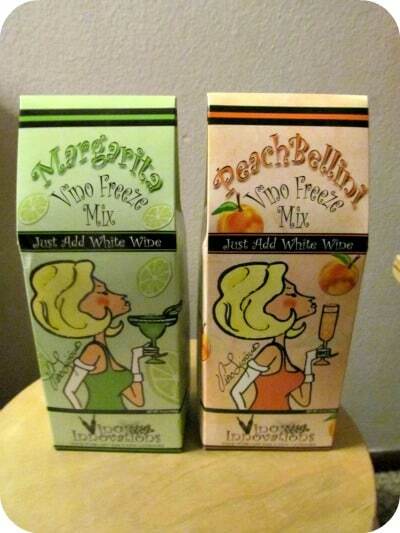 My favorite is the Peach Bellini Vino Freeze Mix which I added to a bottle of white wine. It has a nice peach flavor with sweetness that is just right and not overpowering. I mixed it up in a glass pitcher and placed in it in the deep freezer for about 3 ½ hours until it was similar in consistency to a slushie. My sister and husband love a good Margarita so I knew that the Margarita Vino Freeze Mix would be a hit with both of them and it really hit the mark. For this batch, I used the blender which gave it the perfect Margarita consistency and it went great with a bottle of white wine I had been saving for a special occasion. 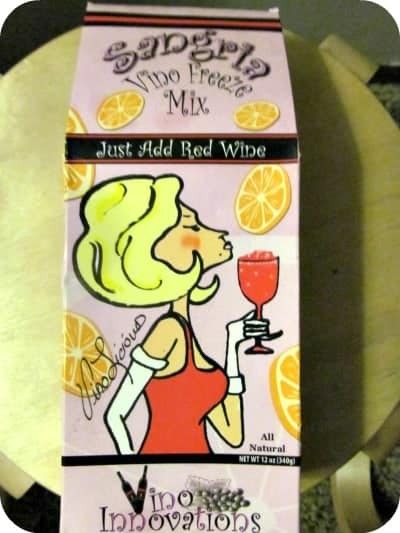 I love red wine and good Sangria is my favorite so I was very excited to try the Sangria Vino Freeze Mix. It was absolutely delicious and I personally love that it included natural flavors and beet juice for the coloring. I will be purchasing more of this mix to serve at my Christmas and New Year’s Eve gatherings too. Don’t forget to garnish with oranges, limes, pineapple, peaches and any of your favorite fruits. You are invited to visit Old World Gourmet to browse the wide selection of Vino Freeze mixes including some that I would love to try too like the Lemoncillo and Blueberry Pomegranate. These high quality wine mixes are available for purchase for the SRP of $10 each or you can purchase a variety pack of three mixes which I recommend for only $24. Old World Gourmet is proud to have unique drink and snack mixes as well as seasonal offerings too. Connect with Old World Gourmet on Facebook. These are great for a party. Just add your wine to them and your all set to go – so simple and so easy to make. i think I’ll have a peach bellini thank you, I want mine slushie like. Check out their page they got snack stuff to for your parties. I love margaritas but sometimes I find the Tequila taste overwhelming. Can’t wait to try the marg mix! I have not heard of this brand before your review and I like sangria. These mixes simplify everything. Thanks for the review. Oh my goodness. My mother would love these and her birthday is coming up! that looks pretty simple and “elegant” to bring to a girls night out. These sound absolutely delicious. I’m a huge wine fan and love to experiment. The Margarita mix looks great; anything to make great mixed drinks quickly and easily. Thanks! I’ve never heard of these before, but enjoy something different. I have never even seen these or heard about them. Thanks for the new idea!! I’m not a big fan of most white wine and I received some for Christmas. This Peach Bellini Vino Freeze Mix would be a perfect way to enjoy it. I would love to try these for my birthday tomorrow Dec. 31st. I love white wine and red. I love the idea of these! I love sangria so I really want to try this. I’m so surprised by the white wine margarita! I’ve never heard of such a thing, but it sounds delicious! These sound good. I like both of these types of drinks and these mixes make it easy to enjoy them. These are both summer drinks for me, so it may be a while before I try them. Thanks for the review. This product is such a good idea because sometimes just drinking plain wine does not do the trick. I like adding white wine to this Wine Mixers to give my wine a different flavor. I like the Old World Gourmet flavors! I have never heard of this before but it sounds really good. My sister in law would love this! They look cute & I can’t wait to try them! These really sound good. I love a slushy and this is close!! Yum a wine cooler at home. I am going to have to track these down and buy some! What a great way to serve wine drinks, particularly in the summer! The flavors sound delicious, and will definitely be a hit with my friends.